I finished editing work on Alamein, Brian Knipple's holy-grail masterwork on the namesake battles of June to November 1942, dragging badly from heat exhaustion. That was probably brought on by overwork and the Alabama sun, not reflective heat from the map and counters. The game at the time was the most difficult project we'd ever worked on. It used the same system in some of our earliest games. It's a game engine that is very "crunchy," to use a term from role-playing design. A role-playing game and particularly a supplement with "lots of crunchy bits" is held to be a good thing. But role-playing works much differently than a board game. A game master handles the rules and explains them; most of the time, he or she is the only one who evens needs to know that a particular rule exists, much less how it's implemented. Special rules for how dung will disperse when flung at a target (the engineer Brian Knipple wrote those for Vlad the Impaler, after some backyard testing) or special combat abilities of a chicken and a bee (John Phythyon, Celtic Age) — things like these make for a better game and are very popular with players. While you want to add more to role-playing, you usually want to deduct from a board game. Game "development" seems to mean different things at different firms and in different sectors of the game industry. We expect the game designer to do his own homework, to see that the game's been tested and that it comes to us working just as well as he thinks it possibly can. Then the developer refines this, serving mostly like an editor. So you're not trying to create the game you would have designed, but rather clarify the game designer's vision. In the case of a complex game, that means getting its ideas across in as clear a manner as possible. And Alamein has a lot of vision. Units are rated for attack, defense, movement, armor quality, anti-tank capability, and morale. Artillery can have all of those plus offensive and defensive support strengths plus range. Leaders can affect movement or combat — but only after a die-roll. There are two kinds of movement (tactical and strategic), two kinds of stacking, minefields, tank vs. anti-tank combat, artillery limbering and unlimbering, and a lot more I'm either forgetting or blocking out of my mind. Like many comparisons, this is a relative one. There have been many wargames published by other firms with far more complexity, with convoluted rule systems that mistake detail for insight. Alamein's not one of those by any stretch of the imagination; the amazing thing is how neatly this seeming excess dovetails together to form a clear and focused historical narrative. Alamein is what we call a "holy grail" game. The term comes from another publisher's ad copy from the mid-1990s, calling a massive Civil War battle game "a holy grail for Dave Powell" (who designed our Gettysburg and Chickamauga games). It connotes not just a favorite project, but an obsession lovingly layered with special rules for every detail of historical occurrence. I used to work for a guy who loved to scream, "Just because you found it out, don't make it @#&%! *$ news!" He ended up taking a hospital PR job because he was overstressed and needed the health plan, but his rantings were pretty much on target. Most of what needed ejecting from Alamein was in the process, not the historical details. A designer with a genius IQ and photographic memory can come up with some interesting ways to do things. For example, losses in battle inflicted randomly on the units involved. "How do you choose?" "Take them off the map, put them in a container, pull one out." There can be 20 units or more belonging to the attacker, some on their reverse side. "How do you know which side the counter was on, and how do you know where to put it back on the map?" "You just remember it. You mean you can't?" I'm doing well to remember how many children I have. All of the photographic-memory rules had to go: random losses, pre-designated attacks, pre-designated special movement attempts, units receiving replacements not being allowed to move for a turn, and many more. I suppose I could have crafted markers for a lot of that and kept the rules, but the game worked fine without them and, thanks to its size, was moving slowly enough as it stood. 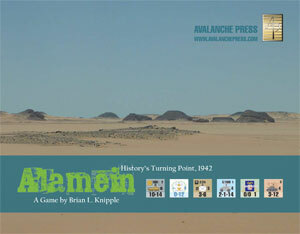 Now with that said, no one's going to buy or play Alamein for a quick afternoon of gaming fun. We have plenty of $30 wargames for that. For an intense experience of hard-core, hex-and-counter wargaming, this is the game. The artillery subsystem is simply brilliant; each unit has a corresponding support marker you place on the target hex. You can fire it twice (once for each side) and then you need more ammunition. The Allied player usually has all the ammunition he'll ever need, though not so much that he could just blaze away with his artillery just because he can. The Axis player is going to have to be choosy. Likewise, there are two supply subsystems working side by side. I was pretty well horrified when I saw this, but in practice it actually works very elegantly. Units draw supply every turn by tracing a path to their formation's headquarters, which then must trace a path to a corps or army headquarters, which then must trace a path off the edge of the map (east for the Allies, west for the Axis). This is pretty standard wargame fare, and represents the usual wear and tear of combat, the need for a minimal stock of small-arms ammunition and of food and fuel. But that's not all. There are also supply points for both sides. The game takes place over a series of "game days," each in turn divided into an initial segment and four turns (A.M., mid-day, P.M. and night). During the initial segment, players must spend a supply point for each headquarters if it is to act as a link in the supply chain for the rest of the day. Otherwise, it and all of its units remain out of supply no matter what path-tracing they accomplish. Formations (divisions, plus one independent brigade on each side) don't just look to their headquarters for supply. They can also be "prepared" for the day, by a much greater expenditure of supply points. A prepared formation can launch two to four attacks per turn, depending on its type and nationality. An unprepared one can only mount a single attack. That puts the Axis player in a quandary. The Italian infantry divisions will rarely be prepared: they're much smaller than Allied or German divisions, with only two regiments even at full strength (and they will almost never be at full strength), so limiting them to one attack isn't such a sacrifice as they'll have a hard time mustering the force to make more than one. But the panzer divisions and the big 90th Light hold the Axis player's striking power, and preparing them all will cost 13 supply points per day, when the most the Axis will receive is 15 per day (and that drops fast after mid-July). By taking some supply points from the general Axis pool, the Axis player can just barely keep all his spearhead formations (the three divisions of the Afrika Korps and the three smaller Italian divisions of the XXI Mobile Corps) at full capacity. But that's not all he has to worry about. Alamein adds a new dimension, an air game. Both players have fighter and bomber squadrons they can use to harass enemy movement, attack enemy ground units, and interdict enemy supplies (blow up supply points and artillery ammunition). It also costs supply points to fly your planes (you made the choice to bring in aviation gas and bombs instead of diesel fuel and tank shells). 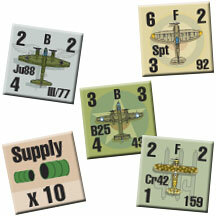 The Allied player has more aircraft, and more supply points to put them into the air. The Axis player can choose to burn supply points to counter them (and the German and some Italian fighters are quite good), or leave them unchallenged, save the supply points for ground use, and watch his supply dumps burn. Either way, the Axis supply situation is going to get steadily worse, with Rommel's ability to attack steadily eroding as the stockpile of supplies seized at the fall of Tobruk piddles away. So it's definitely a crunchy concept, two supply systems, but it models the positions of each player extremely well. "Rommel" has every reason to strike quickly, while "Montgomery" is better off building up a massive supply stockpile and sending his larger formations forward all at once, with all of them prepared every day. And that's just one example in a game rich in detail yet flowing smoothly together. It won't play fast, but it does play well.